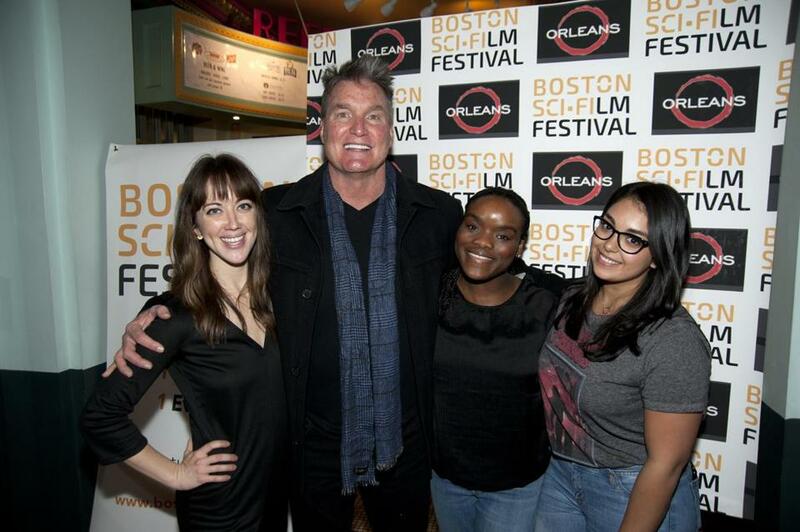 Actor Sam J. Jones poses with members of the Boston Sci-Fi Film Festival staff (from left): Elsa McLaughlin, Olivia Grant, and Tishna Lodi. Whatever happened to Sam J. Jones? After saving the universe in 1980 sci-fi classic “Flash Gordon,” the film’s charismatic star faded into obscurity, never reaching the levels of fame his now-legendary breakthrough role had seemed to all but guarantee. The documentary “Life After Flash,” which on Friday opened the 44th Boston Sci-Fi Film Festival (the fest continues through Feb. 18 at the Somerville Theatre), explores the actor’s unusual career trajectory. In town for the fest, the actor, now 64, spoke to the Globe about the doc and a fateful clash with Hollywood mogul Dino De Laurentiis. Q. How did it feel to be approached by “Life After Flash” director Lisa Downs? A. It’s a little disconcerting. First of all, you’re like, “Hold on, I have a lot of years left.” And secondly, you have no idea what it’s going to be. You can’t write the script until you’re finished filming, because you don’t know what you’re going to capture. For me, it’s a dos and don’ts of life. I talk about a decision I was faced with, why I chose what I did, and the consequences that followed. Q. A dispute between you and De Laurentiis led to “Flash Gordon” sequels being scrapped. What happened? A. He didn’t pay me my weekly salary. I didn’t really need it — I was making $4,000 a month per diem — but by week 8, I’d called my representation out from LA. [Before they arrived,] Dino said, “Why don’t you step into my office? I’ll give you what you want.” And I said, “I don’t think that would be very wise of me. You’ve done 300 movies. I’m 23. And I’d agree to what? I wouldn’t know what I’m agreeing to.” In hindsight, I’d signed a six-picture deal, so I should have gone in there, appeased him. But my attorneys said the only way I’d get paid was to not show up to work. I went with that, without thinking of the outcome. I didn’t know it was the three biggest days of filming, with 400 extras, and I’d decided to not show up, costing the budget a fortune. Q. This impacted your career. Did you and De Laurentiis speak again? A. I did call him years later, asking for forgiveness. I said, “We’ve had this tension over our relationship for years; please forgive me for any harm or bad decisions on my part.” And his reply was, “Bah! Sam! It’s okay!” I thought that was cool. Q. You portray a villain in “Axcellerator,” another film at this fest. What’s it like acting in smaller-scale projects? A. The freedom’s unbelievable. You have to share the director’s vision. But listen to other actors, and you can get some real magic happening, from improvising. As actors, you can give to each other.